Drug and substance abuse has become a major social menace destroying millions of lives and causing health hazards to teenagers and youths across the world. Its fast spread is so alarming that even children are exposed to this and some are even introduced to drugs in early life by their siblings or school mates. It is a general belief that young people are highly vulnerable (adventurous). So, they are more likely to experiment with drugs and alcohol than adults. These habits most times are carried into adulthood. Preventing teenagers from abuse of drugs and alcohol means getting and nurturing them through a vulnerable time of their lives. It is a known fact and research has it that people are more likely to develop an addiction in adulthood if they start abusing drugs from a tender age (formative years) because their brain is still developing and this can have a long term cognitive effect on them. There is a common misconception and general belief that teenagers who are into drugs and alcohol are bad kids. Most times, there is an underlying cause either they are rebellious and want to lash back on their parents on an unresolved issue, boredom, neglect by parents, broken or abusive homes, depression, stress, low self-esteem, curiosity (wants to know what it feels like) bonding into a social group that is known for using these substances or peer influence, “now or never” syndrome feeling imperative to experiment and experience all we can while we are still young. These youths see drugs and substance abuse as a means to build their self-confidence or as pastime to be explored. The unfortunate aspect is that these kids know drugs and substances are bad for them but they believe that they are invincible. They don't believe that anything bad can actually happen to them. The rate at which this drug and substance abuse is spreading and slowly destroying the lives of our future generation is disheartening. The rising cases of drug and substance abuse among Nigerian youths and most worrisome, teens in secondary schools with a special attention on the ones resident in Osun State. The rising spate of drug abuse among teenagers and youths calls for all hands to be on deck to address the menace. The increase in the misuse of prescription drugs as well as the use of illicit drugs, alcohol and substances by adolescent and young adults in the country is worrisome. This has become a problem that plagues our society which needs prompt attention in order to arrest this dangerous trend. Prevention they say is better and cheaper than cure so there is an urgent need to prevent those teens/youths who are not yet involved and to convince and counsel those who are in it on its harmful effects and why they need to discontinue using them. This situation requires urgent proactive and pragmatic solution. 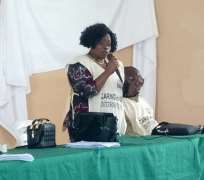 On our part, the Youth Development Initiative arm of Caring Hands International (CHI), a non-governmental, non-partisan and non-tribal organization in Osogbo, Osun State in partnership with Youths Without Drugs (YWD) a non-governmental organization based in Osun State have have resolved to take steps towards curtailing this menace. CHI and YWD have taken up the responsibility of creating awareness and sensitizing youths and teens in Secondary Schools to stem down this cancerous tide using the theme: "Reaching Youths before Drugs Do”. Our goal is to improve the wellbeing of the coming generation who are our future leaders and to reduce morbidity and mortality in years to come”. We have taken the campaign to various schools and organizations inxluding the Ataoja High School, Good Tidings Standard Collegiate, Kings and Queens Academy, ECWA Fountain of Life Chapel all in Osogbo, Osun State among many others. We are currently working on extending the campaign to Out-of-School Youths, especially the artisans, commercial drivers, okada riders, and other category of concerned youths in the motor parks. We believe that victims of drug abuse could still be useful to the society, if given necessary help and rehabilitation. It is a known fact that drug dependent persons are sick, so they need our help. Our intention is to make them drug independent, useful to themselves and the society". I must comment Pastor Ola Owojaiye of YWD for his determination and cooperation to nib this social menace in the bud. We urged parents to be friends of their children, to spend quality time with them, be inquisitive or feel concerned about their welfare, care to listen and answer their questions when asked. Religious organizations are also encouraged to create forum to talk and dissuade the minds of young persons from going into drug and substance abuse.